A PM reminded me about these. The Gilera CX125 was designed by Federico Martini after he left Bimota. It used the basic frame and engine of the Gilera SP01 / SP02 / Crono / GFR series with a single sided fork produced by Paoli. We have a few of these. One is my better halfs, bought in Milan in 1991 and brought back. It has been the least reliable bike we have ever had, and is a nightmare to work on (the bodywork has to all come off to do just about anything, and it is not easily removed, added to which it has become very brittle with age). About 15 years ago we bought another locally quite cheaply, but stripped down and quite butchered. Idea was to eventually sort it out. Then a couple of years after that we picked up a heavily crashed one for spare parts. This one had been crashed hard enough to bend the fork (and I wouldn't trust the frame to be that straight! ), and hadn't been well cared for (one of the engine mounting bolts turned out to be a length of random threaded rod). Also we landed up buying a fair few bits and pieces from someone who had bought one to stick in a big single cylinder engine. The one taken to the Manchester show was the crashed one. We had the frame powder coated and quickly rebuilt it with a replacement fork. Did have one issue as the spare shock I have which should have been good turned out to have the wrong size top mount. Hence it landed up with a very scabby rear shock. As there is no intention for it to go on the road I landed up using stainless steel bolts for most things, including the brake disk. Looks pretty but probably not safe to ride! This piccy was taken a few years ago, of the complete CX and the first rolling chassis. 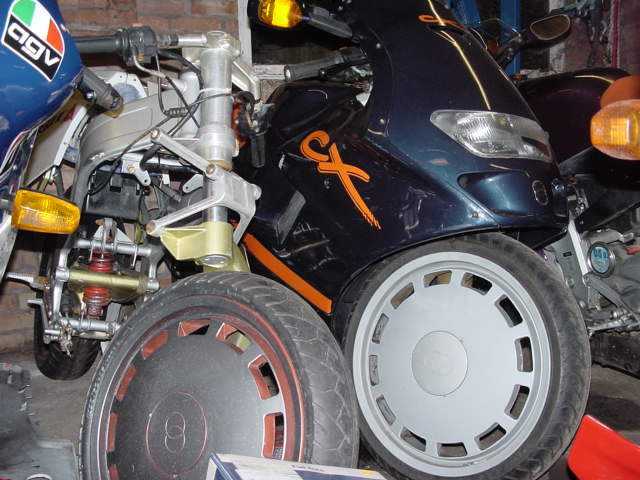 Note that the scissor mechanism on the rolling chassis is on upside down (as I said, it had been butchered!). After the Manchester show I decided to put an engine in the rolling chassis. The engine is actually the one bought from the guy who was replacing it with a big single. I painted up the exhaust and connected up the front brake line. This was a bit of a pain as the line goes through the front fork. I landed up putting 2 long cable ties together and threading them through the fork, then using small cable ties to attach the end of the line to the end of the cable ties, and pulled it down. Once down with a bit of manipulation I managed to get the hose out of the bottom hole in the fork. Not bled the brakes through, partly as the calipers were tarted up for the show and the paint probably wouldn't appreciate brake fluid! There are still things I will do. I am sorting out a wiring loom to go on it, probably repairing the butchered one (eg, they cut the wires for the regulator / rectifier 6 inches from the spade connectors onto the unit - leaving the spade connectors attached to the regulator / rectifier - WHY!). I will put some spare clocks on it, but I need to sort out the front sub frame. I have 3 but all are a bit dodgy. One has been bent and broken and badly welded up numerous times, one looks OK except one bend, but when I tried to straighten that I felt the steel give. And one (from the crashed bike) is twisted to one side. There are a few small metal brackets that need sorting out; for example the steel brackets that go between the foot pegs and the hangers which could do with replating. Current aim is to get it to a state where the engine can be started and run. It can be wheeled out to the odd show, but otherwise act as a rolling spares store!. We are in a similar situation. I have a CX & it is in need of a couple of bits & pieces to get it finished. I bought it from a museum here in Aus & it was in fairly ordinary condition & had not been run by the looks of it. It must have had an engine seize at one stage as the rear axle is twisted at the spline. I have been waiting for parts since last July. If I lived in Britain I could go & see the seller & pick them up. The trouble with this model is the total lack of available spares. I have done a fair few worldwide searches to no avail, apart from the guy in Britain. Bob Wright is normally good for spares. Would need a lot more than an engine seize to twist the spindle i think. Possibly someone trying badly to remive the sprocket carrier. We were in Aus in 1996 and surprised to see a cx for sale in a bike trder paper. Think the spindle is probably the same on the gfr125. Is the GFR a single sided swingarm? The first CX saw was in Perth in about 1993/4. The local importer was the Aussie agent at the time. I know the guy who did the Australian compliance document for the importer. Lots of parts in Japan LOTS ! Yes the GFR does use a single sided swinging arm. How did they get the original headlight through ADR checks, with it dipping the wrong way? Who do I talk to mate? There was a CX125 up for sale in California a year ago. Very clean bike, it sold for $5900. Cool looking bike but at $5900 I be buying something much more substantial. Thanks for your help everybody. Hopefully I can move forward on this girl now. It is different. Will sort out the other ones at some point to have a usable one. Need to order a few wiring connectors to repair the loom. Finally getting some progress on mine Katy. Managed to get parts out of Japan with a key part I have been waiting on for 8 months arriving this week.